Walleye fishing in Nestor Falls opens the 3rd Saturday in May. That’s coming right up real soon! To get you folks thinking about Walleye season, here’s a fish story about how Steve Johnson and his fishing partner Jim Bahrke caught a 29 in. 11 lb. Walleye. 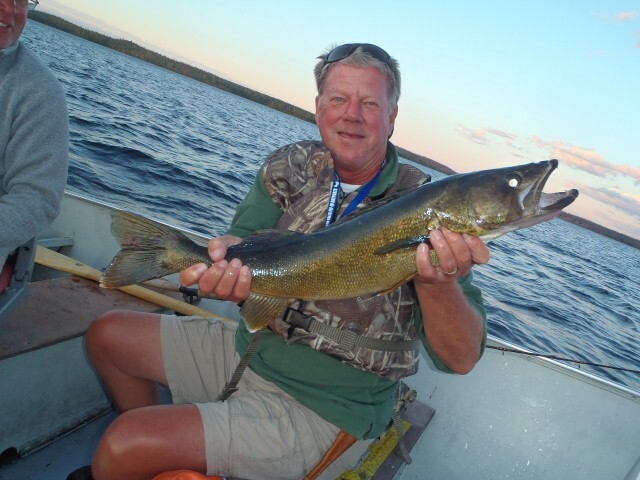 The duo had been doing fly-in fishing trips to Northwestern Ontario for 40 years, but this Walleye was easily the largest Walleye they’d ever caught fishing in Ontario. It was caught during a late August evening, the group’s last day on Larus Lake. Earlier in the week, a GIANT 42 in. Northern had t-boned a Walleye Steve was landing, but wasn’t able to net that Northern. So his goal for the last night was to land a trophy Northern. To the boat’s surprise, when they netted the lunker, it wasn’t a Northern, but the 29 in. 11 lb. Walleye! Just goes to show that when you’re Walleye fishing with Nestor Falls Fly-In, anything can happen. See you all in a couple weeks!